- Visit the Alhambra of Granada without any pressure, with our easily accessible Audio Guide available on your Smartphone or Tablet. - Audio guide for adults and children. - Pick up from your hotel to the monument included. Discover the Alhambra of Granada, it is a World Heritage Site by UNESCO and it’s one of the most visited monuments all over the world. Visitors to Granada can’t leave without visiting this amazing and wonderful monument. If you prefer to visit a monument without the commitment to follow a touristic guide, if you prefer to discover and explore the monument alone at your own pace; we offer you the best solution. It will be the perfect compromise to visit the Alhambra alone but without losing any description or details. The Audio Guided Tour of the Alhambra made by Granavisión, contains audio and written explanations about the “Red Fortress”, descriptions about its decorations, histories about its more ancient legends that will help you to feel as you lived there at the time of the Moorish Kings. - Download it on your Smartphone. - Delivery of the Audio Guide with a Tablet 7”(5 Hours autonomy). - In our device you will have access to all the information you need to plan your visit at this incredible monument, one of the most visited in the world. "The Alhambra and the Red Castle" is a story with an aim to find the hidden key to save the Alhambra, if you don’t find the key the Alhambra will disappear. You'll become the true hero of the story and not just a viewer. During the search for the key hidden in the city of the Alhambra you will meet some of the most important people who lived there, you will find them in each of the four most important areas of the monument. 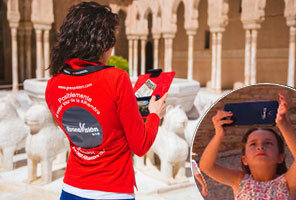 They have tasks to guide you through the monument and tell you the history and the legends of the Alhambra. The games and tests that you have to pass, keep up your level of attention throughout the visit, it will also allow you to improve your skills, practice grammar, writing and reading, you will learn many things while having fun and without any effort. It will be an experience that will show values like friendship, peace and the sense of family. It will allow you to get closer to Arab culture; you will discover the customs and traditions that will show you how to discover other cultures with respect and tolerance. With our Audio Guide for Children: "The Alhambra. The Red Castle” you will have aunique and unforgettable experience. Time and meeting point: We will pick you up at your hotel between 9.15 and 10.00 am. One of our hostesses will ask for you at the reception and on the way to get to the monument, you'll enjoy a stunning panoramic view of the city. If you are not staying in a hotel in the city, or if you want to come with your own vehicle, the meeting point is at the Welcome Visitor Centre de Granavisión in front of the parking lot number 1 (P1) of the monument, at 10.00 in the morning. End of the tour: After the visit you can enjoy a pleasant walk through the woods of Sabika’s hill to reach the city center. (Return transportation is not included). 2)	Alhambra Audio guide for adults (in ). - Download from App Store (+ 1.79€ for each device): App on your full version for your iOS smartphone or tablet (with all audio). 3)	Alhambra Audio guide for children in 3D (only in - children between 4 - 11 years). - Download from App Store (+ 2.69€ for each device):App on your full version for your iOS smartphone or tablet. 4)	Pick up from your hotel, located in the city, to the monument. 2)	Transfer back to your hotel. (ii) Once the application is installed on your Smartphone or Tablet, select the language in which you want to download the audio guide (Spanish, English, German, French or Italian). (iii) Google Play: Click on the "Audio" and will be asked you if you have booked a tourist service with our company, click on the "Yes" button, and introduce the details of the booking (E-mail and reservation number which will be sent with the voucher). (iv) App Store: in iOS the price is 1.79€ to download all audio. (ii) Google Play: Once the application is installed on your Android Smartphone or Tablet, to the full content accer have to validate the app with your booking details (E-mail and reservation number which will be sent with the voucher). (iii) App Store: in iOS the price is 2.69€ to download the full version. 4) Print the voucher and show it to our tour guide. The voucher is the proof of the booking. You will not need to show anything else to get your ticket. Please note that you can always recover your booking voucher on our website in the section "My reservation" by entering your e-mail address and the reservation code. Further confirmations are not required, except in the case you didn’t gave the name of the hotel where you will stay. In this case, please contact us any day before the date of your visit, between 11 am and 13 pm at ( +34) 682 086 011 or (+34) 958 535 872. In case your hotel does not appear on the list of pick-up points above, you will get assigned the closest pick-up point selecting your hotel here on the map. In case your hotel doesn't appear in the list, please fill in the complete address in order to provide you with an alternative pick-up point close to your hotel.